What's better than a 150-inch plasma? There's always one. "Hey, look at us folks, we've got the loudest, the brightest, the fastest, the biggest...". This year its Panasonic that gets the Award for Unnecessary Excess, for its monstrous 150-inch plasma, the biggest on planet Earth and, rather pretentiously, called the Life Screen. And if that's not big enough for you, Panasonic also has the equally ridiculous Life Wall: lots and lots of big plasmas filling every inch of a living room wall. Throw in some face recognition and touch-screen tech and you have yourself an 'entertainment wall'. Or something. Must be Japanese. 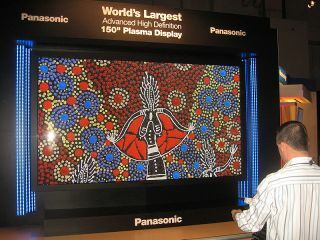 It's a great PR stunt - Panasonic's 150-inch plasma is one of the most covered CES stories so far according to Google News. But, good though the so-called Life Screen might be, it has steered attention away from much more interesting technological developments. Panasonic has also produced a one-inch thick plasma TV that consumes less than half the power of last year's model. Now that's a much more interesting advance in terms of technology. Who would want a 150-inch telly anyway, except maybe for an airport or live music venue? Panasonic actually gave away a load of its products to random families across the States last year, and studied how they interacted with the technology over many months. The idea was to see if the top home technology can actually bring families closer together, helping them have better 'experiences' consuming and 'sharing' content. CES punters were greeted with happy home videos of said guinea pigs reveling in all this technology. Well - you'd be happy too if you'd just been given a load of top notch kit. Some more quantitative analysis for you: according to Panasonic execs, their $70,000 103-inch plasma (their current biggest on the market) has sold 5,000 units in the last 18 months. Not much in the grand scheme of things. Big-big TVs have a small target audience, so it's difficult not to see the 150-inch plasma prototype as nothing more than a marketing exercise. It's all a load of ballyhoo. Big is certainly good. But improvements in quality and resolution are even better. But neither are the most interesting TV stories from this year's CES. Far more encouraging are the multiple announcements showing that TV hardware manufacturers are working closer with content providers to bring a wider range of material to the small screen. In particular, the bridge between web content and TV has significantly narrowed. Online content should be far easier to access through your TV set in the future. Panasonic and Google have teamed up to make Picasa and YouTube content available directly through Panasonic sets. You can more comfortably waste time watching amateur videos and browsing your holiday snaps from the comfort of your sofa. Sharp is also piping online weather forecasts and stock market information to its Aquos TVs via Aquos Net. Samsung will be taking news from USA Today and making it available on its TVs via a few clicks of the remote control. Sony and HP made similar nods towards internet TV in 2006. LG, meanwhile, will be manufacturing a Netflix internet-connected device to stream movies directly to your TV. And Microsoft is turning its Xbox 360 into a source of comprehensive video downloads with newly announced content partnerships with Disney, MGM and ABC in America. Cable set-top boxes are also being integrated into TVs - no wires - thanks to open cable architectures being championed by Comcast. It remains to be seen if this level of set-top/TV integration will extend to Virgin Media in the UK. And of course there are more ways to stream content - often wirelessly - to and from TVs this year. And more TV sets can link directly to digital cameras, camcorders and other devices to playback home brewed content this year. OK, so adoption of internet-connected TVs and set-top boxes has been slow (it's about 2 per cent of the total TV market according to some reports). But the point is the technology is getting more user friendly and affordable. There seems to be less need, for instance, for complex configuration of your home network. And as for web-based content, it's increasingly a matter of just plugging your television into a phone socket and browsing the shows through an EPG. If there's anything to take away from CES 2008, it's that consumer electronics and the content played on CE devices are going to be more interoperable in the next few years. Integration. That's the really interesting story.